Life with the Cincinnati Reds isn’t always the easiest when you’re a standout player. Just ask Joey Votto, a player who doesn’t get anywhere near the credit he deserves for being perhaps the largest on-base threat over the last five or so years. Eugenio Suarez falls into a similar category as far as the element of neglect is concerned. Not only has his August been better than any other individual at the hot corner, but he’s spinning those numbers into another extremely effective campaign as a followup to what was already a career year in 2016. The last 30 days have been particularly remarkable for Suarez. He leads the position in WAR over that time, but is also leading (or ranking near the top of the pack) in several other essential offensive categories. He’s third in batting average (.349) and reaching base at a .491 clip that’s easily the best among the 28 qualifying players over that span. He’s reaching base in almost half of his 110 plate appearances thus far in the past month. As such, there are some pretty interesting developments that have taken place that lend themselves to the current intrigue surrounding Suarez. That absurd OBP is largely thanks to a walk rate that sits just a touch over 20% for the month, easily better than the rest of the group at third. The power has been there as well, as his .373 isolated power trails only Josh Donaldson, who’s having a stellar past month in his own right, and Manny Machado. Additionally, Suarez is absolutely pounding the ball over that same length of time. His Hard% ranks atop the list, at a 42.4% mark, which has helped him to a 25.0 HR/FB ratio that ranks second among third sackers. It all culminates in a park-adjusted offense of 204 over that time for Suarez, 12 points higher than the next closest player (Donaldson). 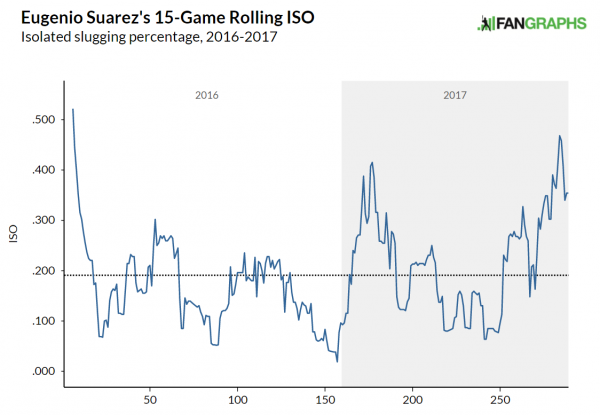 There were some pretty low valleys in 2016, but Suarez has largely been able to avoid those this year, and maintain an ISO above league average for a much more consistent period of time throughout this season. Part of that could be related to his approach, as his Swing% is down a touch and his walks are up, which each help to indicate that. When it comes down to it, though, this past month should really come as no surprise for Suarez, given what he churned out in 2016, as well as this year prior to the month of August. His first half wasn’t quite as strong, as he hit only .254, but still played pretty well on the power side (.183 ISO) and reached base at a rate over .350. His walk rate in the first half was over 12%, with Suarez driving that percentage up over 17% in the second half. His second half has obviously jettisoned him to some pretty remarkable numbers out of the Cincinnati hot corner, and makes him an extremely intriguing commodity moving forward. The way his approach and power have developed over the past two years have been absolutely remarkable to watch. The total body of work really speaks for itself. Overall, Suarez has put together a year that features a .274/.385/.501/.886, with the .221 ISO and 131 wRC+. It’s certainly worth pondering if he’s begun to establish a new norm moving forward, or if this is the peak of his value, with no place to go but down. His apparently improved approach has resulted in the increased walk rate and ability to make harder contact over the course of the last two or three years. As such, the BABIP has gone up a touch, but not so high that it’s an unsustainable figure moving forward. Those elements should aid him in remaining a stable presence at the plate moving forward. Of course, there’s obviously a major element to consider here in relation to Eugenio Suarez’s success. Playing his home games in Cincinnati obviously plays strongly into his favor, as indicated by his rather severe home and road splits. This is especially true on the power side, where he’s posted a .102 ISO away from his home ballpark. However, the total body of work is still extremely impressive, even if the splits aren’t quite as favorable for him on the away side of things. The benefits of his home park certainly outweigh the drawbacks away from it. However, should the Reds seek to move him this offseason, then that certainly would rock his value quite a bit, depending on where he were to land. Given the variables involved, it’s difficult to go all-in on Eugenio Suarez in the short-term. There are obviously plenty of benefits to his current game, in terms of the approach and power combination that has recently developed. However, with an uncertain future that could take away the tremendous benefit of playing his home games in Cincinnati, one can’t help but be a little bit apprehensive about his value moving forward. We hoped you liked reading Eugenio Suarez’s Absurd August by Randy Holt! Maybe I am missing something, but why is his future in Cincinnati uncertain? My guess is because of Snezel, however, as a big Snezel believer, I think Snezel will be moved off 3rd because of Suarez’s success. I think Suarez will be in Cincy through, at least his Arb years. And wouldn’t be surprised to see the Reds offer him a contract that eats up his remaining Arb years & hopefully a year or 2 more,in the off season.